Yunnan Province includes areas of Tibet. Born: 1954, Haimen, Jiangsu Province. Education: Chinese literature at Jiang’an University, PostGraduate degree in Economics, MBA. Career: Worked as a school teacher from 1973 – 1977, joined the Party in 1976. District positions were followed by a stint in Shanghai at the same time as Xi Jinping. In 2011 he became Vice-Chairman of the All-China Federation of Trade Unions. Governor of Yunnan since 2014. Prospects: Thought to be an ally of Xi Jinping. Promoted to Party Secretary following the removal of Li Jiheng. Relevance to Tibet: As Yunnan Province Party Secretary, responsible for large areas of Tibet. This is a mini-profile. 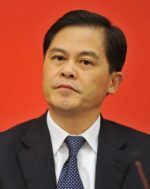 Chen Hao has worked in Yunnan as Vice-Governor, Acting Governor and then Governor since 2014, but his promotion is being linked to the time he worked alongside Xi Jinping in Shanghai. Address: Yunnan Provincial General Office, Wuhuashan, Kunming, Yunnan 650021. This entry was posted in Profiles and tagged China, Chinese Communist Party, Party Secretary, Tibet, Tibet Work Leading Group, Yunnan. Bookmark the permalink.